Golden Software is excited to announce the release of Strater. Strater is a well log and borehole plotting software program that imports your data from a multitude of sources (database files, data files, LAS files, ODBC, and OLE DB data sources). Strater provides innumerable ways to graphically display your data. All the logs are fully customizable to suit your needs. Design and save template and scheme files to make log creation efficient and consistent, create multi-page continuous logs, and quickly display new borehole logs. Utilize the header and footer panes to store all the information about the logs, such as well number, driller, location, method, company name, and company logo. The flexibility Strater offers is unparalleled. Strater is written for use with Windows 98, Me, 2000, XP, Vista, and Windows 7. Strater easily creates a multitude of log types to visualize your depth data. Strater offers unsurpassed flexibility in log design and layout. The advanced user interface makes designing and displaying your data easier than ever. Simply select the log type you want to create, click on the page where you want the log to be created, specify a data file and the import parameters, and the log is created! No other log plotting package in its class can create logs this easily! Customize your borehole designs by easily creating, editing, and updating illustrative and informative header, footer, and log items in their separate design areas. Strater includes 12 popular log types to graphically display your data. Each of the logs can be modified to suit your needs. The header and footer areas are ideal to store the detailed information about the logs, such as well number, driller, location, drilling method, company name, and company logo. Strater offers interactive point-and-click selection and modification of every item in your borehole design. We want to make sure you can have all your data and logs easily accessible in one project. Strater allows you to create multiple borehole views and data tables and store them all in a single project. Each borehole view can contain a different borehole design, allowing tremendous flexibility in the presentation of your data. You can easily switch between borehole views with a single click! You can also import and store data for multiple boreholes in one data table. Having the data for all your boreholes together allows you to switch between borehole names with a single click. When you change the borehole names, the logs update immediately and automatically with the new information! Strater includes 12 popular log types to graphically display your data: zone bar, bar, percentage, graphic, well construction, lithology, post, classed post, complex text, line/symbol, crossplot, and depth logs. Strater logs give you full control over all log parameters. You can accept the Strater defaults to automatically create a log, or select a log and easily customize the log features in the Property Inspector. Display a wide variety of logging data with the zone bar log. For instance, zone bars can represent sample intervals, alteration zones, contamination layers, etc. They also provide a mechanism to display simple keyword text objects either with or without background fill. Show your data as either a standard bar log or a polarity bar log! A standard bar plots a bar from the data minimum value to the row's data value. The polarity bar plots data based upon zero, so if there is a mix of negative and positive data, bars exist on both sides of the zero line. Effortlessly switch the bar type for bar logs between standard and polarity. Plot your data using a bar log! Visually compare the percentages of items in a borehole easily using the percentage log! The percentage log can be used to show different percentages of alteration types, mineralization types, geochemical data, or rock types. The percentage log uses data fields to create a series of blocks (interval data) or polygons (depth data). You can select any number of numerical fields from a specified table. If you select five fields, five different blocks or polygons are created. The data for each row are normalized to 100 percent, so the data in each row's field can be any value. Show the percentage of multiple components per sampling interval using the percentage log! Create graphic logs that display images directly on the log. The graphic log allows you to specify bitmap file names and show the bitmaps at specified intervals. This is useful in displaying photos of the core, alteration, rock types, sample intervals, etc. Display bitmap images as a log. Graphic logs are great for showing images versus depth, such as core or thin section photos. The well construction log replicates a well construction diagram for the log, and is generally used in the environmental industry. 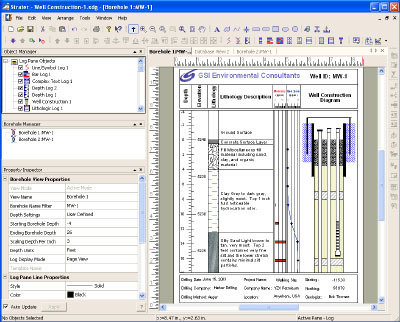 The well construction log shows how the monitoring well or piezometer was created. This log shows items such as screen, packing material, end caps, and covers. The well construction log is a visual representation of the well rather than a detailed engineering drawing to scale. 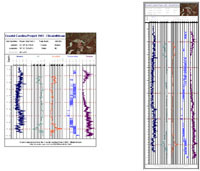 Show the various stratigraphic layers in the borehole using the lithology log. The display can be as simple as a filled block, or the display can be more elaborate and show weathering patterns and contact line styles. Lithology logs can show distinct contact line styles and indent percentages/scales to show weathering profiles. Use the lithology log type to display all your lithologic data! Post symbols at certain depth locations using a post log. You can rotate symbols to any angle specified in the data table. Classed post logs are used to display symbol positions and text at particular depths with symbol properties based on numerical values in the data. Symbols can be rotated according to data in the data table. The log also allows placing text at one of five positions relative to the symbol position. Classed post logs display a symbol at each depth location with the symbol properties based upon another field of data. You can choose to show text labels. Complex text logs can be used to show rock descriptions, alteration descriptions, and any general descriptive text that represents interval data. The text is generally more than just one or two words; it is generally a sentence or series of sentences. The long sentences are wrapped to fit within the bounds specified for the log item. Complex text logs can have arrows, brackets, or offset ticks to separate the text fields. Each text block can be individually edited by double clicking on the text section. Display text notes and descriptions easily using the complex text log. You can change the text content or the text properties by simply double clicking over the text. Display your depth data as a graph! Line/symbol logs can be useful for displaying assay values, geophysical parameters, moisture content, etc. You can wrap line/symbol logs with multiple styles: truncate, custom wrap, wrap at a 10X scale, or wrap at a 100X scale. Line/symbol logs show depth data as a graph. See exactly where two curves on a graph intersect using the crossplot log! Crossplots plot two line/symbol logs and highlight where they cross each other. You can specify the curve line, fill, and symbol properties for both curves and you can set the fill properties for the overlapping portion. Quickly see the depth or elevation of your log using the depth log as a scale bar. Optionally set your depth logs to show depth or elevation, or positive or negative values. You can add tick marks, tick mark labels, and specify the interval between major or minor tick marks. Depth logs provide a depth scale for reference. Depth logs can display depths in feet (above, left), meters (above, right), inches, centimeters, millimeters, or yards. Utilize the header and footer design areas to include comprehensive text descriptions, linked text, imported image files, or drawing objects. You can set the header and footer areas to be any size you wish. You can create an exceptional and impressive log by importing company logos, icons, and artwork. You can also speedily click-and-draw and click-and-edit text, polygons, polylines, symbols, rectangles, rounded rectangles, squares, ellipses, and circles. All items can be fully modified, including font, color, size, fills, width, etc. Add text objects in header and footer areas that are linked to your database, such as borehole name, page numbers, field units, or field descriptions. When the borehole information is changed, this information automatically updates. Create informative headers that display detailed information about the project, such as project name, company name, driller or well identifier, location, drilling date, and imported graphics (e.g. company logo or site map). Strater's integral tabbed database view allows you to import, display, enter, edit, sort, and print data. Import data from common spreadsheet and database formats, including: MDB, DBF, DB, LAS, XLS, SLK, WKS, CSV, TXT, DAT, BNA, BLN, ODBC, OLE DB, or other SQL data sources. Strater boasts full Excel import capability, which includes using multiple sheets from a single Excel file! You can import data for multiple boreholes into one data table, and you can create multiple data tables in one project. Available data table types include: collars, depth, interval, lithology, project information, text item, and well construction tables. You can rename any data table to descriptive names to keep your data organized, and you can export any data table to an ASCII text file. If source data files are updated with new information, you can automatically reload the data into Strater to update the logs! The database view provides the functionality needed to make sure you can get your data in the necessary format to create the logs you want. For example, if you have depth data, you can easily convert it to interval data to create zone bar, complex text, or lithology logs! You can define a new borehole in the data table and enter data for that borehole, or you can remove data for a particular borehole at any time. To help make creating a graphic log easy, you can insert a bitmap file path and file name into the database view with just a few clicks – you don’t have to remember and manually type in the file path and file name! You can create multiple types of data tables in the database view and each data table can store data for multiple boreholes. It is always easier to update a log with new data than to start from scratch. Using template files is an essential tool designed to make bulk log processing easy and efficient. Once a borehole is designed, you can reuse the design by saving it as a template. Template files store all the graphical features without the imported data, so you can create borehole designs to be easily reused in other projects or by other users. Use one of the many predefined template that come with Strater, or create your own specific to your needs! Schemes provide a way to load drawing properties based on a keyword or range value defined in the imported data. For example, a lithology log uses lithology schemes. The lithology scheme contains keywords, such as granite, clay, etc. Each of these keywords is assigned a fill pattern, contact line properties, line properties, and text properties. Schemes can be reused; therefore, you do not have to go through the time-consuming process of assigning the same properties each time you create a new log. Reusing template and scheme files is ideal for those who want to continue making the same looking borehole designs for a wide variety of borehole data. The Scheme Editor is where you link specific range values or keywords to display properties. In the example above, the lithology keyword “Granite” is tied to a granite fill pattern and other specific display properties. When the scheme is assigned to a lithology log, every time the word "Granite" is used in the database table field, Strater uses the properties assigned in the scheme in the graphical borehole display. The Scheme Editor is where you link specific range values or keywords to display properties. In the example above, the lithology keyword “Granite” is tied to a granite fill pattern and other specific display properties. When the scheme is assigned to a lithology log, every time the word "Granite" is used in the database table field, Strater uses the properties assigned in the scheme in the graphical borehole display. The user-friendly Property Inspector allows you to interactively edit any object's properties. Select any object and the Property Inspector updates with the specific properties for that object. Once you make a change, you can see the affects of that change immediately in the borehole view – without having to click any OK or Apply buttons! You can easily edit all the properties of a selected object in the Property Inspector! The object manager makes viewing and editing any object simple. It displays all the objects, organized by their design areas, in an easy-to-use hierarchical tree arrangement. Select objects in the Object Manager to easily edit them in the Property Inspector, or check and uncheck the check box to show or hide them. Use the object manager to easily access and edit all the objects that are shown in your borehole view. Use the Borehole Manager to manage the different borehole views contained in the project. Multiple borehole views are useful for displaying multiple graphics for multiple wells or displaying different layouts for the same data. You can add and delete individual borehole views and load and save template files quickly with the Borehole Manager! Organize all your borehole views in the Borehole Manager. With a simple right-click, you can add and delete borehole views, save a borehole view as a template, and load template files into new borehole views! Fill using the included USGS fill patterns. To download a PDF file showing all available fill patterns, click here. Print using Truncate, Fit to Page, or Tile. Change borehole names easily with a click of the mouse! Specify any value in the data to be a NULL value. Display your logs on the screen in page view (left) or full view (right)! Batch print your log design with multiple borehole data! Set the scaling type to be linear or logarithmic. Control the log direction by switching between Left/Right and Low/High. Add scale bars for variable logs in the header or footer areas. Merge intervals in adjacent, identical lithology blocks or zone bars. Overlay logs to create lithological profiles! Single-page or continuous printing! Choose between single-page or continuous printing to any Windows printer or plotter. Automatically or manually set the borehole starting, ending, and scaling depths. Automatically set the borehole depths based on a collars data table. Floating and dockable toolbars offer quick access to Strater's commands and functions. Setup Strater the way you like by controlling and modifying the default settings. Copy your logs in Strater and paste them directly into a Microsoft Word report or PowerPoint presentation! Import formats include: E00, GSI, GSB, BNA, DLG, LGO, LGS, DXF, PLT, BLN, CLP, WMF, EMF, SHP, MIF, DDF, TIF, BMP, TGA, PCX, WPG, DCX, EPS, JPG, PCT, PNG, and GIF. Data formats include: MDB, DBF, DB, LAS, XLS, SLK, WKS, CSV, TXT, DAT, BNA, BLN, ODBC, OLE DB, or other SQL data sources. Export formats include: DXF, DAT, SHP, BNA, GSB, BLN, MIF, GSI, PDF, EPS, CGM, WMF, EMF, CLP, TIF, BMP, TGA, PCX, WPG, PNG, JPG, PCT, DCX, and GIF. 800 X 600 or higher monitor resolution with 16-bit (or higher) color depth. At least 100 MB of additional free hard disk space. At least 64 MB RAM above the Windows requirement for simple data sets.